During my last two years of high school I was a member of the school newspaper staff, first as a reporter and page editor, then as the co-editor in chief. The whole process – brainstorming story ideas as a class, picking which ones we would write, interviewing students, staff, and community members, writing the stories, and then laying it all out in a 8- to12-page format – was exciting and rewarding. The control we had over it all, coupled with an enthusiastic and inspiring adviser, made for a great class. As a graduation gift, that adviser gave a few other staff members and me a book: On Writing Well by William Zinsser. On the first page he wrote a personal inscription that I frequently revisit. There are few books that I carry with me as I move from one place to the next. On Writing Well is one of them. Whenever I have needed inspiration as a writer, I have turned to On Writing Well. I have many memories as an undergraduate student of struggling to turn my thoughts and ideas into coherent sentences and paragraphs. In those times I would often pick up Zinsser’s book and start reading, both to get out of my own head and to search for some of the many insights that fill the book. I am now turning to the book once again. I enjoy writing these posts almost as much as I enjoy creating the graphics. And if I am going to write, I might as well try to write well. So begins the sketching of Zinsser’s wonderful book. These sketches are not an attempt to transfer the entire book from a written to a visual format. The topic of the book requires that it be written, not drawn. My goal is simply to read the book, process the ideas, and record them visually so that I can improve my own writing. Sketches coupled with words and short phrases (such as the ones that I have been posting) serve a particular purpose – they enhance understanding and make it easier to recall information. But well-crafted prose is a joy to read. I would like to become proficient in both crafts – that of the writer, and that of the visual note taker. 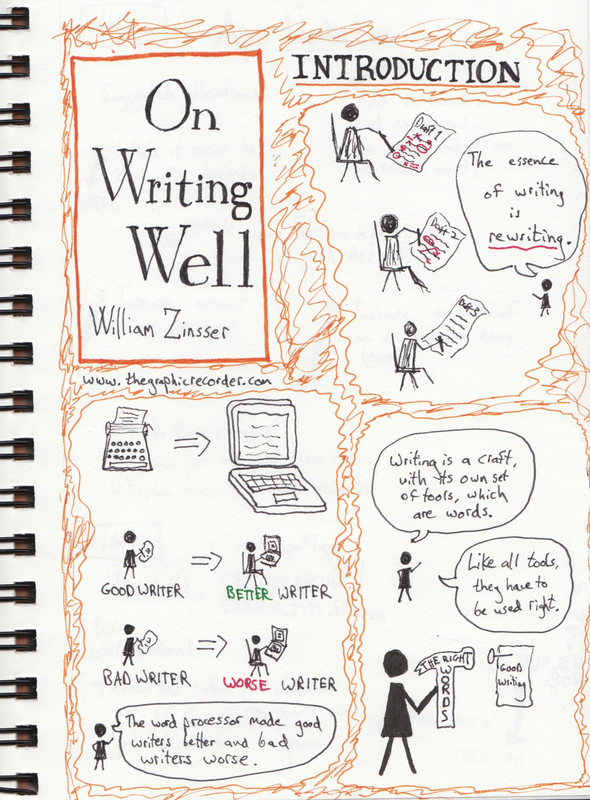 By sketching and writing about On Writing Well, I hope to move a bit closer toward both of those goals.